Edmund's dev blog for gay nerds: Time Fcuk Wins! So i woke up today to find a link to this sitting in my inbox. 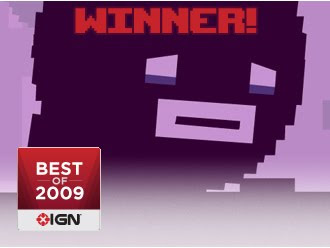 Time Fcuk wins IGN's freeware game of the year! Now of course im very very happy about this, but dont in anyway think that i believe Time Fcuk is better then Spelunky. Spelunky is one of the best indie games of all time let alone of this year. But i will take the win over Scary Girl... no prob. congrats man! but yeah.. splunky is way better no offense. Don't sweat it Edmund. Spelunky was released in December of 2008. You needn't worry about pushing aside anyone more deserving, becuase there wern't none. You have been sharing really amazing Sweater shell here... really It's looking so awesome, I Enjoyed it. This is an amazing blog post here.... Really its great to be here.... Thanks very much! I love the article. You have teached a lot in this. Are you a fan of cosplay? I am. I just bought my cheap fairy tail cosplay from this store. It is really great to wear. The size fits well. And I am super in love with this. If you want to buy cheap frozen costume, I think www.alicestyless.com would be a great choice for you.